MOA ~ 10 for long distance shooting. Made in the UK using high-grade aircraft aluminum, which is specially selected for its rigidity and resilience to ensure accuracy, each rail is anodised with a very high quality satin black finish. The rail includes screws and the correct hex key head. 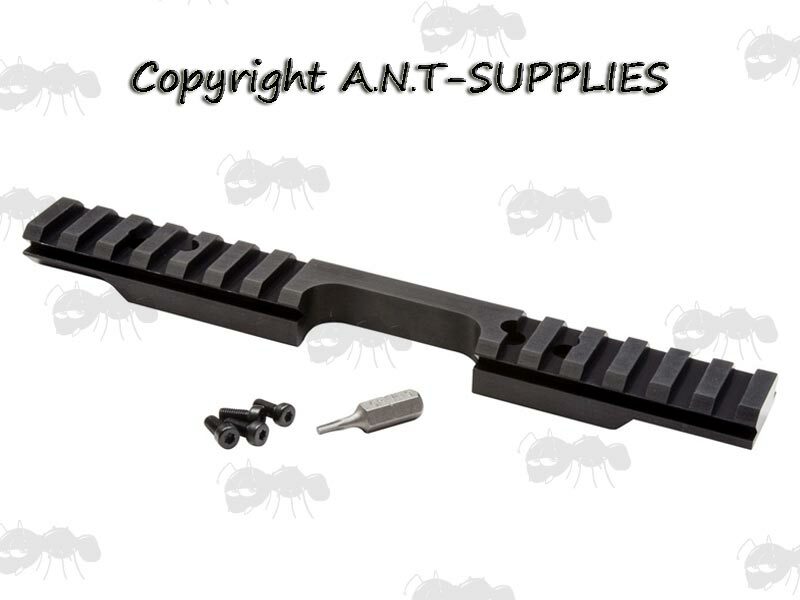 One-piece design Picatinny sight base rail. It will accept both Picatinny and Weaver style mounts. 10, 10FC, 10GC, 11, 12, 14, 16, 16C. The rail has a round base to accommodate rounded receivers. Picatinny rail engineered to meet military specifications. For those who wish to achieve the most accuracy from their scope and rifle set-up. 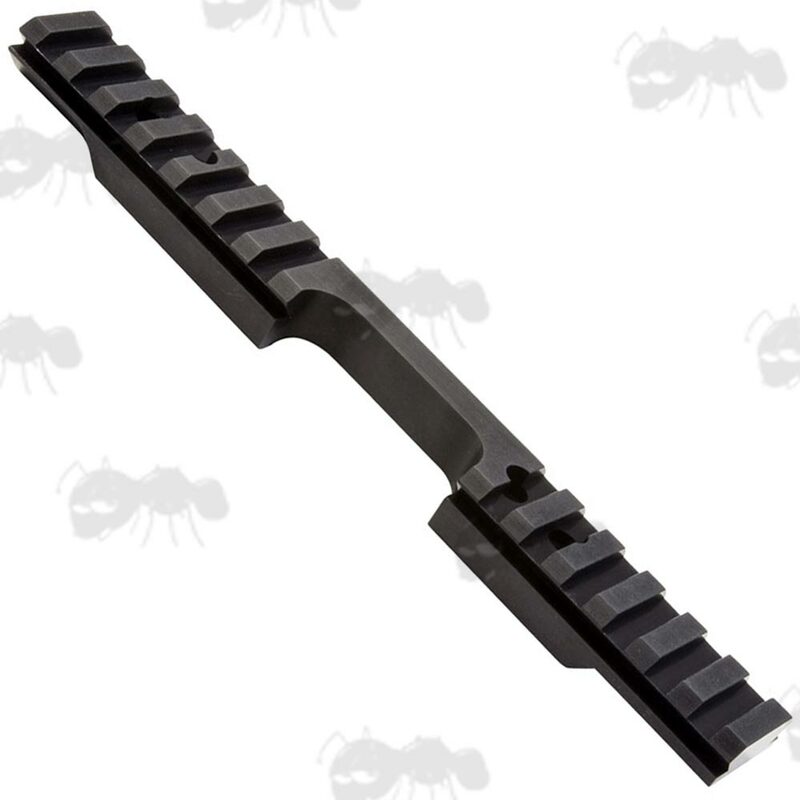 Affordably priced true MIL-STD-1913 design, extends the length of the action and features an inclined base. Many picatinny rail designs currently on the market are not tight enough and result in the scope moving which can be highly frustrating when zeroing. It's like putting a very expensive vase on a wobbly table. This new design extends the mounting length, allows easier mounting for the perfect eye relief of longer modern scopes as well as night vision equipment and delivers better use of the elevation turret to shoot at longer distances thanks to the inclined base. Features an inclined base at 10MOA, allowing for better use of elevation with your scope, but not so inclined that stalking scopes or optics with less adjustment can't still be zeroed at 100 yards. The profile on these rails offer the best combination of maximum support and alignment. Your scope rings are supported not only on the uppermost edges but from underneath as well, just as the original specifications intended (shown on the left in the image below). The means your scope rings must be aligned to the rail on which they are fitted. Many rails don't have this type of design, instead having an a simpler to machine and cheaper to achieve profile, so you would have minimal support from the upper surfaces of the rail only (shown on the right in the image below). This in turn means that your rings are likely to be slightly out of alignment.